Libyan men carry the coffin, gesture and chant slogans during funeral of Libyan rebels' slain military chief Abdel-Fattah Younis in the rebel-held town of Benghazi, Libya, on July 29. 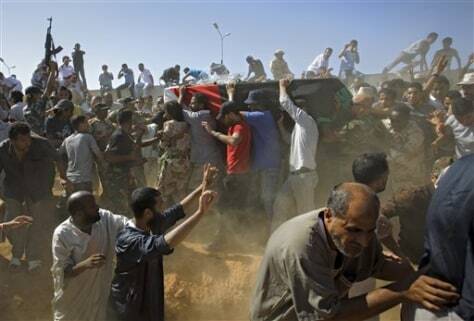 Thousands of mourners marched in the funeral procession Friday for the Libyan rebels' slain military chief, a day after he was gunned down under still mysterious circumstances. Abdel-Fattah Younis was killed as he traveled from his front lines operations room to the rebels' de facto capital Benghazi.